It's like Jeff Van Zeeland, part of the gang that gets together for an annual Canadian prairie waterfowl hunt, says: "Each trip is a lot like Christmas. We know there are presents under the tree, but we have no clue what they are until we unwrap them." Such was the case for Tom Van Handel and I on an early October morning. With all the anticipation of overgrown kids, we began tearing away at the ribbons and fancy wrapping paper of a trip that held all the promise of a shiny new gift. "Welcome to the 240,000-plus acres of Lake Dauphin, boys," our grinning guide, Russell McKay, announced, as our skiff slowed to an idle in the mouth of the Valley River. Then, after sticking his nose in the wind like on old buck, and studying the wave action through squinting eyes, he cracked the throttle and soon had us blasting along a serpentine trail of bulrushes. It was a solid 10-minute run before he slowed and deposited us, our gear and dogs -- my yellow Lab, Tanner, and Tom's black, Red -- on a sandbar heavy with cattails. After deploying a dozen canvasback blocks, and the same number of mallard decoys in separate groups, Russ motored down the shore to hide the boat. As we settled into the natural cover, pre-dawn's first light, a fluorescent band of orange and yellow, began to flame atop the lake's white-capped chop. With the canopy of stars dimming and the eastern sky turning a lighter shade of blue, strings of divers, their wings just a blur in the oncoming light, traded up and down the shore. And the puddlers, mostly mallards, but with a sprinkling of pintails, wigeon and teal, materialized in black silhouette overhead. When Russ rejoined us, he noted that several species of ducks had come and gone without us even attempting a shot, so he quipped, "Why, after driving two days to shoot ducks...aren't you?" Morning's first light over a block of decoys. "We're just enjoying the show," came Tom's quick but not totally honest reply. We simply got caught flat-footed with empty guns. And with that, our first ducks of the gunning season went unharmed. But soon after we got down to duck-shooting business. Taking the birds as they came, we volleyed steel on divers and puddlers alike. And while we didn't shoot well early on, every barrage still produced retrieving work for both Tanner and Red. Once in the swing of things, the shoot went too quickly. In the end, our combined 16-bird bag included no less than five species of divers and puddle ducks -- a classic big-water hunt. Thrilled with the positive start, Tom and I were optimistic about the rest of the hunting trip. Russell's plan for day two was to hunt potholes -- openings, really -- in expansive reed beds that separated Lake Dauphin's hard shore from its open water. We set up in a place that looked every bit the Sheboygan Marsh of my youth. After chucking the blocks into the water, we simply ran the boat into a thick stand of tullies and sat back and waited for the morning, and the ducks, to come. Settin' up on Lake Dauphin. But few did, prompting Russ to suggest we pull the mobile rig from the small hole we were in, and move to a larger open-water pocket. There, in the lee of a rush-infested point, we reset the blocks and once again rammed the boat into the thick, natural cover. Even though the weather was an obstacle, with high skies, light breezes and temperatures climbing into the 70s, we put together a good mixed bag of mallards and pintails, redheads and wigeon, ringnecks and a single bull canvasback. Though the shooting wasn't fast and furious, the work of Tanner and Red, as they marked long falls and handled birds that dropped into the thick cover unseen, made the day memorable. As time went on, Tom and I had developed a comfort level with the skills and knowledge of our guide, but the sheer size of Lake Dauphin, and its relatively unpopulated, uncharted marshy shores, still proved daunting, and in need of definite respect. And just to prove that point, the lake up and bit us the next day. Underwater obstructions can wreak havoc on a motor. During an early-morning high-speed run along one of the lake's shorelines, a rock, unseen due to the year's abnormally high water, wiped out our lower unit. After paddling to shore I was "voted" to go look for help, and took off on a 3 1/2-mile wader-clad hike. Halfway through the help-seeking mission, Tanner and I finally strolled into a goose spread laid out by a couple of lads from Tennessee. After explaining my situation, they promptly produced a cell phone. I called our outfitter back at camp. He showed up with a trailer, and we had things back in order in time for an afternoon hunt. Feeling bad about the mishap, Russell asked if we might be interested in towing a boat up to Lake Winnipegosis the next day. We'd launch at Duck Bay and motor out eight miles to hunt Russell's "home turf." Since the whole point of the trip was to explore Manitoba's big-water hunting options, we jumped at the chance. It was another bluebird morning as we cruised north out of Duck Bay. Deftly running through reed-lined channels and around a series of islands big and small, we were soon approaching a tiny, shoal-type island Russell wanted to hunt. There we set the "canvass" blocks, as Russ called them, in a deep-water channel that opened to what he simply referred to as the bay, but which to me appeared every bit as expansive as one of our Great Lakes. We spread the mallard decoys close to shore on the shallow, lee side of the island, just around the corner from the divers. trast to Russell's bold prediction, were downright scarce. Save for a few goldeneyes and persistent buffleheads, there just wasn't anything moving. Tanner and Red awaiting instructions. But Russell remained optimistic. In fact, he could only smile confidently as he explained and motioned. "This is how the birds will play the game here, boys. The mallards, and maybe some teal, will come from that big marsh to the west. They'll come in singles, pairs and small flocks. The divers, mostly redheads, but probably a few cans too, will come from the big water to the north. And when they come, they'll come by the busloads." "Our school buses hold 23 kids," Russ replied. "There'll be about that many redheads in a flock," Russ continued, and then added, "Just be ready, there are plenty busloads out there." The better part of two hours went by without a single sighting. I was beginning to have my doubts, when the slightest of breezes began to stir. Minutes later a roar came from the open water to the north, a deafening noise that was not unlike a jetliner on its takeoff roll. The noise was so out of the ordinary in our otherwise placid setting that it set the hair on the back of my neck on end. I looked at Russell. "Yes sir," he said. "They'll be here soon!" It was the strangest thing I ever saw. With only a light chop lapping at our scrawny little island, the big water was getting uncomfortable for the birds. Soon the midday sky over the ocean-sized expanse to the northwest was etched with strings of divers -- mostly redheads, we'd soon find out -- winging their way south to the more protected waters of the lower bay. Our hunting group was the only thing in their path. Tanner with a mouthful of Winnipegosis redhead. Then, just as our guide had predicted, here they came, busload after busload. With the wind on their tails, more flocks than not banked hard to strafe our decoys. The shooting was as fast and furious as we'd let it be. The only lulls in the action were self-imposed, as we took the time to enjoy some terrific retrieving work. The gunning was over nearly as fast as it had begun. Not because the birds had quit working -- they were still shredding air and attacking our position as we reloaded -- but because our bags were filled too quickly. We lingered for a while, simply enjoying the spectacle, watching the aerobatic flight of the redheads. Their numbers were so great I could only guess they pushed five figures. It was a hunt. It was a show. It was an experience I'll never forget. After spending one more day on Winnipegosis and another on Lake Dauphin, our adventure had come to an end. 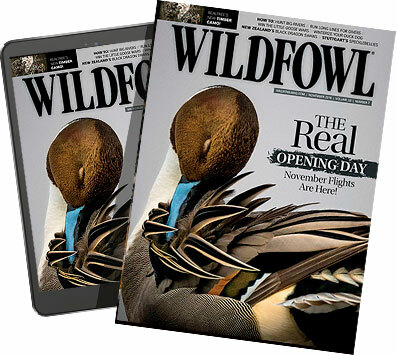 Our quest to find simple, no frills, big-water duck hunting, the type that would be a true throwback to the wonderful world of wildfowl, had been fulfilled. Guide Russell McKay at the helm. After packing up on the last afternoon we sat outside our cabin overlooking the Valley River, sipping a cold one and savoring the satisfaction that comes with a great hunt when Cody, outfitter Dale Goran's towheaded six-year-old son, came by. During the course of the week Cody had become our sidekick. He'd look for us after school, feed treats to the dogs and enjoy the kiddie cocktail we built for him. Knowing we were leaving the next day, Cody casually asked what we thought of the place, and if we'd be coming back. We let the youngster know that we had been impressed, and that yeah, we'd be back. "Aw, that's good to hear guys," he offered in a sincere and serious tone that was way beyond his years. Then he added, taking a phrase from a movie he'd recently seen, "You know, this is a very special place for me, it's my patch of heaven." Thanks for sharing it with us, Cody. Editor's Note: Dale Goran owns Sportsman's Lodge near Dauphin, Manitoba. Sportsman's Lodge at RR #1 Sifton, Manitoba R0L1X0, (800-557-1235). When we talk about Manitoba's big-lake country we're referring primarily to Lakes Winnipeg, Manitoba, Dauphin, Winnipegosis and to a lesser extent, numerous but smaller lakes stretching northwest from Winnipegosis to the Pas. As mentioned, we sampled only small parts of Lake Dauphin and 181-mile-long, 48-mile-wide Lake Winnipegosis. All of these expansive lake-country waters offer basic, boat-suitable hunting, the type commonly along their shores. What makes the hunting exceptional is that all of these waters, and their bordering marshes, not only produce ducks, they stage them, particularly divers, in massive numbers. Lakes Dauphin and Winnipegosis lie in the heart of the continent's breeding grounds most heavily utilized by canvasbacks and redheads. Hunting in Manitoba's lake country is excellent from the season's opener in September on through freezing. But lake-country duck populations ebb and flow throughout the fall. Early gunning is supported primarily by local production. Waterfowl populations mount throughout early October, peaking by the third week of the month. After that time, with the onset of freezing weather and the seasonal migrations, they dwindle steadily. Manitoba lake country is huge. Hunting pressure is light to nonexistent. And the birds, as a result, are always willing. While decoy rigs don't have to be elaborate, boats need to be substantial enough to deal with the rough waters. Freelancing is available to those adventurous hunters who are properly equipped. Time and experience on the big lakes is needed to hunt them safely and successfully on your own. There are a number of outfitters scattered throughout Manitoba's lake country, and they are probably the way to go for first timers and those simply interested in sampling a new locale. Carlton St. Winnipeg, Manitoba R3C 3H8, (800-665-0040).